The BBC understands a member of staff has been suspended ov er the footage. 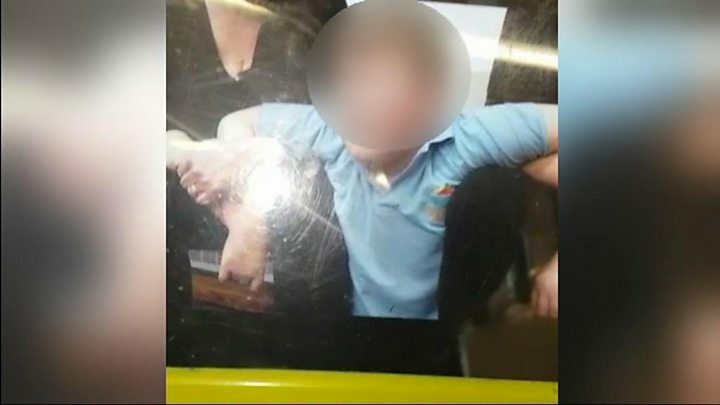 In a letter Derek Brown, North Lanarkshire Council's joint interim director of children and families, wrote: "We have discovered evidence of what, on the face of it, appears to be inappropriate use of pupil restraint and inappropriate restraint techniques being used." Mr Brown told parents the evidence was "historical and not current". But he added: "It will be for the police to investigate and determine whether a criminal offence has taken place." The development comes just days after Education Scotland produced a withering inspection report on the school, describing it as "weak" in two categories - Learning, Teaching and Assessment, and Raising Attainment and Achievement. It was also graded "unsatisfactory" in the categories of Leadership of Change, and Ensuring Wellbeing, Equality and Inclusion. A force spokeswoman said: "An investigation is under way after Police Scotland was made aware by the local authority of concerns about the conduct of staff at a school in North Lanarkshire. "The safety and wellbeing of children in our care is our primary concern and, on being presented with this material, we took immediate steps to launch a formal investigation. "Given the nature of some of the video evidence, we also immediately contacted Police Scotland." The spokesman added: "Both of these investigations are at an early stage and we will keep parents updated as they progress. Last year Scotland's children and young people's commissioner expressed concern about the "ungoverned" and potentially illegal use of restraint and seclusion in the country's schools. Bruce Adamson told The Guardian: "We are deeply concerned that significant physical interventions may be taking place without any kind of policy or procedure at local authority level to ensure the lawful and rights-compliant treatment of children."